Pictured is the 8’-8 1⁄2” x 28’0” x 8’6” high Thermo-Kool walk-in cooler/freezer which recently shipped to St. Francis Healthcare System in Oahu, Hawaii. Thermo- Kool’s uncompromising commitment to the highest level of quality and excellent customer service make a perfect fit for the prestigious facility. 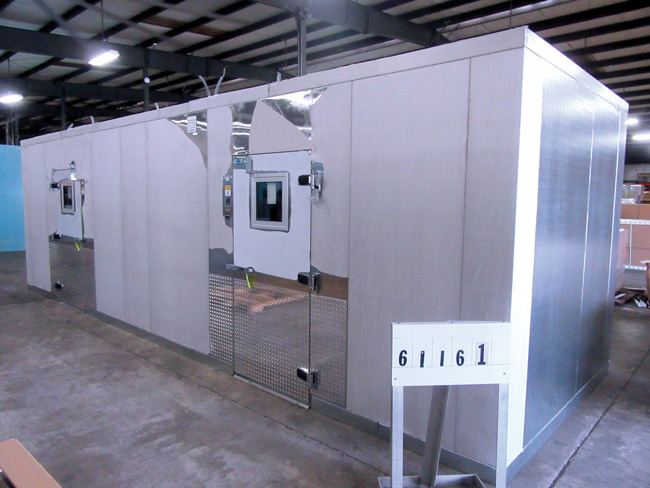 With Thermo-Kool’s high density DURATHANE panel perimeter the Thermo-Kool team had the ability to preassemble the walk-in cooler/freezer prior to shipment for a thorough quality control inspection to avoid “hidden costs” at the time of installation. The exact size needed to maximize storage space capabilities was accomplished due to Thermo-Kool’s ability to manufacturer in 1” panel increments. The exposed exterior is stainless steel which provides an aesthetically appealing finish. The interior finish is white stucco aluminum which along with the LED light fixtures ensures maximum illumination. The interior floors are designed with Thermo- Kool’s DURA-Floor heavy duty structural support floor to give additional strength of up to 12,000 lb stationary load per square foot to the floors. Foamed-in-place interior ramps are an integral part of the floor design for each compartment. To comply with the Energy Independence and Security Act the walk-in cooler/freezer features temperature alarms/door monitors with panic switches and motion detectors, 14” x 14” peep windows and vinyl strip curtains. For additional protection from excessive cart traffic, two rows of stainless steel hat-shaped bumper rails were provided on the exposed exterior. The project was specified by Orlando Espinosa, III with Orlando Espinosa & Associates, Glen Mills, Pennsylvania. Thermo-Kool Customer Account Representative, Debbi Tisdale worked on the project with Espinosa and Jay Kutschera, Project Management Supervisor and Jeff Morse, Installation Manager with Singer Equipment Company, Bellmawr, New Jersey and Thermo- Kool Marketing Agent, Price McIlvaine with The McIlvaine Group, Media, Pennsylvania.